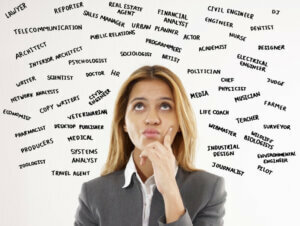 Choosing a Major: Is the Job Market Your Only Concern? Many of us know which option we find most appealing when money is removed from the equation. But the more we lean toward that option, the more stridently we’re warned away from it on the grounds that it may not provide a steady income. This leaves us with the remaining four, which include one or two that seem crushingly boring despite their promise of lifelong stability. But is this an acceptable trade off? And what if that promise isn’t as well founded as it seems? At this intersection, the road leads off in five directions. All five are mysteries shrouded in hearsay and advice both good and terrible. If you’re young, you don’t have the benefit of life experience to guide you. And as much as you’d like to separate money (or any other single factor) from the whole complex equation, you know that doing so is unrealistic. What should you do? Unfortunately, LiveCareer’s experts don’t know you personally, so they can’t answer that. But they are stocked full of useful advice, so here are five questions. Consider each one carefully, and by the time you’ve answered them all, you may start to see the outline of solution. Do you realize that even after you choose a major, graduate, and work professionally for a few years, you can still change your mind? If you fully understand this and are willing to make that change when you need to, good. If not, you may have a rough road ahead– Make the right choice now or you’re in for a world of angst and confusion in the years to come. No pressure. Do you realize that if you sell out present happiness and satisfaction in exchange for future money, the money is still not guaranteed to arrive? Do you realize that if you give up money in exchange for the promise of satisfaction, the satisfaction may never arrive? Do you have a back-up plan in the event of either of these? Are you an introvert or an extrovert? If you don’t know what these are, look them up. Then factor them into your decision. This one distinction alone may have a staggering impact on the happiness or misery you feel in your future career. Do you like being told what to do, or would you prefer to be left in peace with the consequences of your own decisions? Are you a curious person? Regardless of your future career, what would you like to know more about right now? There…are you feeling a little more certain about your decision? If you are, terrific. Sleep on it and see if your certainty persists. If not, it’s time to head back to the drawing board. Do some research and explore various career fields. Review job market and industry news, take some career tests, and ask your college career counselors for job search advice. If you’re still stuck after that, meditate a little longer and try again. This is one choice you can’t put off forever. Author: LiveCareer (www.livecareer.com), home to America’s #1 Resume Builder, connects job seekers of all experience levels and career categories to all the tools, resources and insider tips needed to win the job. Check outwww.facebook.com/Livecareer or follow @LiveCareer for advice and tips on all things career- and resume-related.